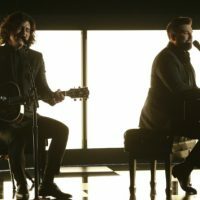 Monty Brinton/CBSDan + Shay walked away with the Best Country Duo/Group Performance Grammy at Sunday night’s ceremony in Los Angeles. But their performance of “Tequila” also got a lot of attention from potential new fans: It was the #1 most-Shazamed performance of the night. Lots of folks were also wondering about the song Kacey Musgraves performed. The four-time winner’s new single, “Rainbow,” was the seventh most-Shazamed Grammy moment. One part of the evening’s Dolly Parton tribute also made Shazam’s top ten: Dolly’s recreation of the Trio II version of Neil Young’s classic “After the Gold Rush,” with Maren Morris and Miley Cyrus.